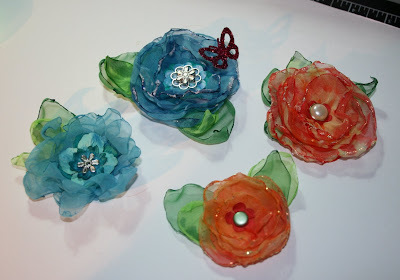 The "priscillastyles" Blog: Mid Week Midnight Madness "Chiffon Flower Tutorial"
Mid Week Midnight Madness "Chiffon Flower Tutorial"
Our team is going to try and have these a couple of times a month and really hope you can take away something with you to help you with your creativity. 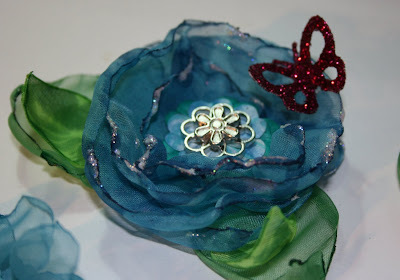 I will be showing you how to make a “Handmade Chiffon Flower” today. Below are some pictures taken while I made up the following flower……. I kind of just made it up and I am just winging it. This is just an example of how I do it, but please keep in mind the sky is the limit with what you can do with this technique. After making up some samples for this tutorial, my mind is reeling with all the possibilities. 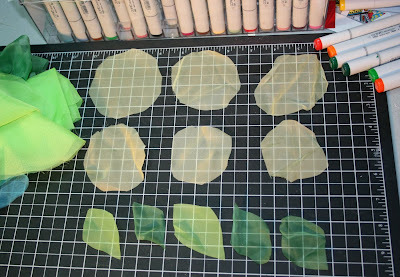 Cut out a few circles and leafs of desired size of the flower you would like. I used 6 layers. The more layers the more full your flower will be. My circles ranged from around 1 1/2 “to 3” in diameter and they do not have to be perfect circles. Very carefully take a lighter (I recommend the long ones you use for lighting the Barbeque, but mine ran out) and LIGHTLY heat the edges of all the cut out pieces. 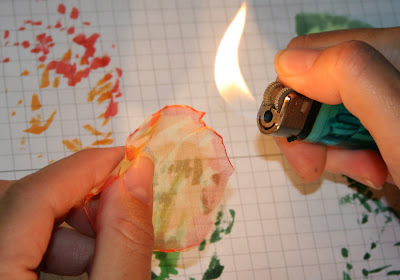 You can use a pair of tweezers to hold the material if you are a little nervous about the flame. You will get the hang of it and it does not have to be perfect. The more uneven the edge, the more interesting the end result will be. Do all pieces and set aside. Just be careful not to touch the edge until it cools. 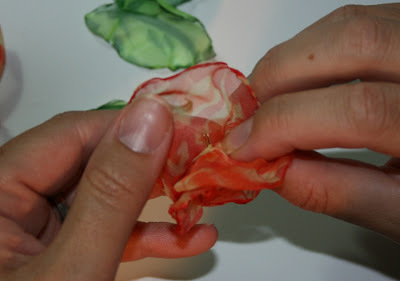 By melting the edges you will seal the edge and create the realistic look for your flower’s pedals. 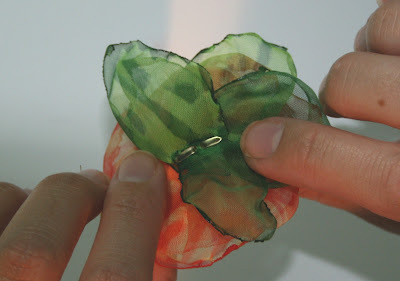 The chiffon will actually start to curl which adds to your flowers beauty. Gather all your pieces and try to use a brad with long prongs. 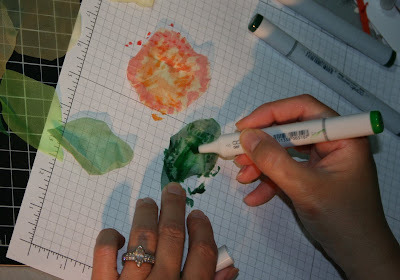 Then start with the center elements of the flower and feed them on to the brad. As you add each layer try to tread the brad through each layer so you get a puffy look. You can thread it in and out a couple of times with each layer. Just play with it, you will see each layer will fall into place and they do not have to be exactly on top of each other. Each layer can be slightly off to one side. Just alternate it so in the end the flower is not to lopsided. 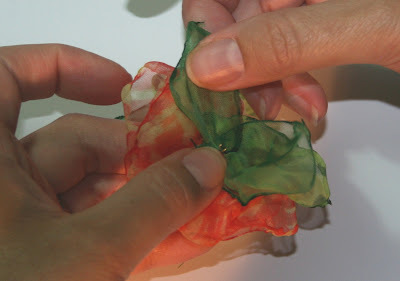 Open and fold down the prongs, add glitter or stickles to the edges as desired !!! Add your own touches to your creations. A butterfly, a bee, dew drops, just have fun with it. I would love to see what you come up with and if you give this a try, PLEASE come back here and post a comment with a link so we can come check out your project. Wow, excellent, thanks for that, will definitely give it a go. Thank you for the tutorial. Results are awesome! These look brilliant, I'll will definately give this one a try. Thanks for the tutorial. You sure do come up with some great ideas. Love this one. I will have to try this! These are beautiful. Thanks for sharing the tutorial. Very cool, that's a great idea to seal the edges. 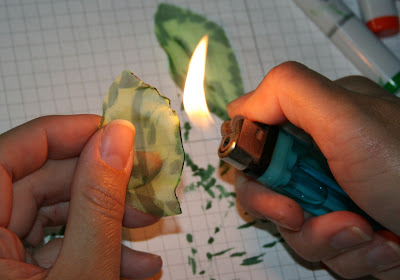 I wonder if you could do it with a match or a candle? Pretty colors for your flowers, they look great. this is wonderful, thank you! would love to see more projects here. Fantastic, what a clever girl you are, these would cost a fortune in the shops. 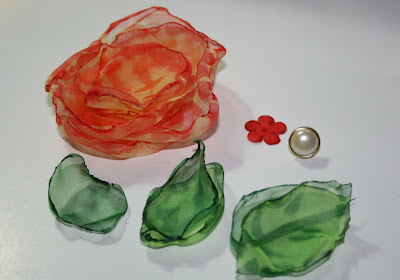 I'm off to buy some chiffon, thanks for the great tutorial, I've saved this page to my favourites so I can refer to it when I start making the flowers. I love the flowers LOVE LOVE LOVE them but a little nervous about that lighter~~ I would hate to start a fire. How about you selling us scaredy cats the finished product??? Oh my! Those are just beautiful!! Thank you thank you for the tutorial!! I just love those flowers. Now I just need to know where to purchase the chiffon ~ we are in a small town with only a walmart and they've taken out the fabric section! Thanks again! This is something to try for sure! Priscilla, Those are AWESOME flowers and look like so much fun to make. They don't have to be perfect as nature isn't perfect. Just love this tutorial!!! Thanks so much for doing it!! I bet if I look I will find chiffon some place in my enormous stash, maybe an old chiffon scarf - hmmmmm!! Now if you hear firetrucks, you will know I got carried away!! 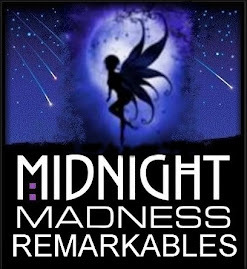 I will have to check it out!!! Wonder if a heat tool would work??? I shall try it too and hope not to melt my fingers. Thanks for this great tutorial. I was wondering how you could make these beautiful flowers. They're gorgeous. that is freaking brilliant - i have to try this! That is stunning! Thanks for the tutorial, I love the idea. 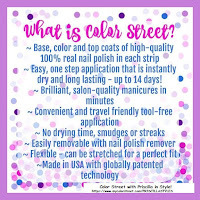 Wonderful tutorial, Miss P. I would love to try this and sometime after I go get some chiffon! Thanks for creating such a wonderful tutorial, I can't wait to try this! The flowers are lovely! I love when you look at the recipe ingredients and have to go "huh?" that lighter threw me off, I would never have guessed that's how you got that cool edge. I likey. LOVE IT!! :) What gorgeous flowers and who knew what that lighter can do to the edges like that?! NEATO :) Thanks so much for the tut...I'd love to see more of them! Keep up the great work ladies!! Wow. . . . stunningly gorgeous flowers!!!! Thanks for the inspiration. Hugs, Christina C.
Thank you for sharing your technique. The flowers are beautiful! Awesome Priscilla! Love the tutorial! Ooooooo this looks like FUN! I must get my hands on some chiffon material so I can try it out! Thanks for the tutorial - I would love to see more! Wow, that is so creative, Priscilla. Thank you for sharing with us. Can't wait to see what else you come up with. Great tutorial and yes... I'd love to see more! There's so much we can all learn from one another... this is great!!! Can't wait to buy some chiffon and try this! Thanks!!! Wow, those flowers are gorgeous. Thanks for the tutorial! Here is a flower that I created from your wonderful tutorial! I love it!! 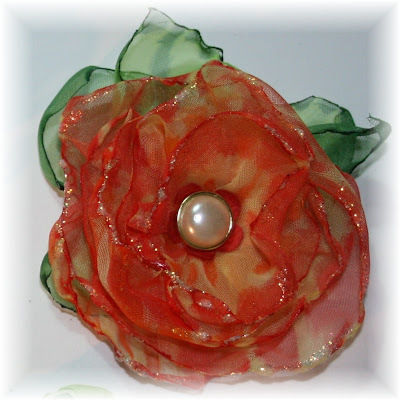 I had some white bridal polyester laying around and used that to create my flower. I burned my edges on the stove and loved the result. I do have 4 leaves placed around my flower which I inked very light so they are hard to spot. 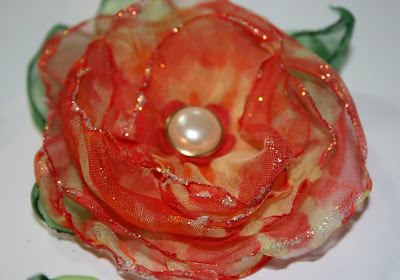 I'm thinking of trying to make a few more flowers from some silk scarfs that I have. This tutorial is AMAZING!!!!! How you managed to make such beautiful flowers and leaves is unbelievable, I must have a go myself. There are many tutorials available, but I must admit, yours is 'unique, and very inspirational'. Thanks for sharing it with us. Great tutorial girlie!!! Awesome results too!! Way to go Priscilla!! I will have to give this a go! WOW ... what an awesome idea ... these are beautiful!! GREAT job on the tutorial also!! Your are really on a roll!! YOU ROCK!! Girl this was awesome!! These flowers are just gorgeous, and a fantastic tutorial, YES WE want to SEE more ;). I thought I posted but it didn't show up... Love the flowers and loved making them. Would organza work? I loved this tutorial!!!!!!!!! Can't wait to try it out. Thanks for this tutorial. It's a great idea and creates a beautiful looks. I'll definitely plan to do this one soon. I went to Hancock Fabrics to buy some chiffon for this and the nice lady behind the counter said, "What are you going to make with the chiffon?" Because I only bought 1/4 yard. I told her, "I'm going to cut it in circles, dye it with an aquapainter, then burn the edges to seal the fabric and make it into flowers." She responded, "Well, I don't have anything nearly that exciting planned for my day!" See? Stamping is exciting! We use fire!! Well I couldn't remember if I commented or not. So I looked at the comments and sure enough, I forgot to comment. Just wanted to say those flowers look gorgeous and I can't wait to try the technique. Thanks also for the opportunity to win some awesome blog candy. And Thank YOU for visiting my blog and leaving such a sweet comment on my card. Thanks for that tutorial. Your flowers are really inspiring, I'll have to try that myself sometime! 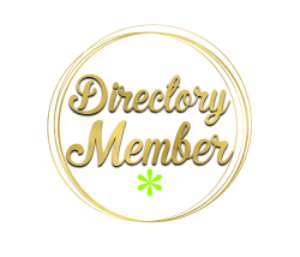 There is something for you on my blog - check it out! Gorgeous flowers, Priscilla, and you make the technique look so easy! fantastic demo ! wonderful flowers ! Love the tutorial. And your pumpkin card is divine! Fantastic! 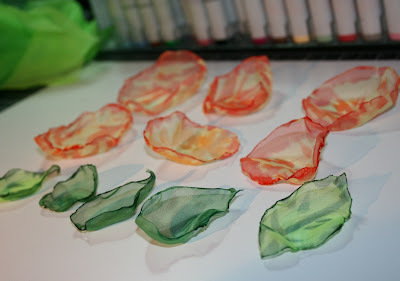 Thank you for the fab tutorial, its amazing how great they look and I so can't wait to get my hand onto some chiffon! thought I would stop in and let you know your button isn't working. It's not displaying and it doesn't link back here when it's clicked! Good thing I follow or I wouldn't know where to find you online!!!! Fabulous tut & I have the "perfect" challenge to use this on this week!!! I'm pretty sure, Priscilla, that a heat gun will do the trick on these flowers & without the "fire", as I've used it before to gently curl the ends of nylon ribbon tails or just to "seal" the cut ends of ribbon! Might make it less scary for us ladies to do. LOVE your gorgeous results and that they're still soft flowers for mailing purposes! So excited I found your blog!!! TFS!!! 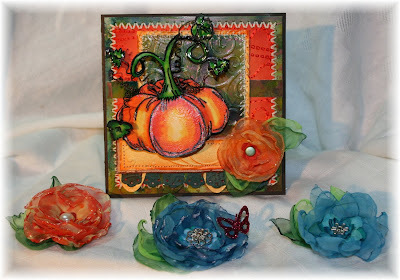 Hi - thanks for a great tutorial - I made some and linked to your blog. I didn't colour them with pens - I used chiffon for one and a silky material for the other. Priscilla, Just fabulous! This is something that I could do. Such a wonderful tutorial. Thanks for sharing with us on CDAC "Link it up to Learn".